Showing 55 articles from November 26, 2013. 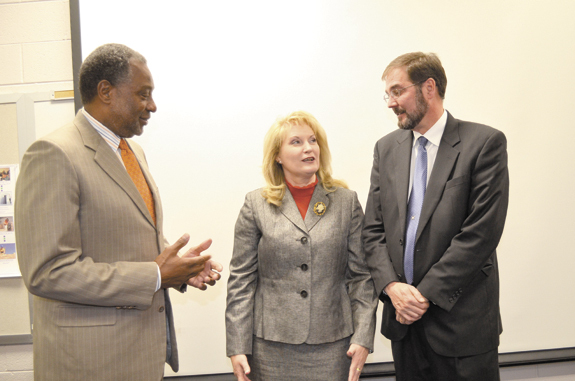 A veteran educator from Virginia, Dr. Lisa Martin, will become the first woman ever to serve as Franklin County Schools’ superintendent following her unanimous selection Monday evening. Dr. Martin is currently assistant superintendent of secondary education and support services for Stafford County Public Schools in Stafford, Virginia. LOUISBURG — Earlier this year, free clinic staff and health department officials blamed the dissolution of their collaborative effort on cultural differences. Recently, it was revealed, their split appeared to be more about money. The issue was brought to light as the Franklin County Volunteers in Medicine (VIM) appeared before commissioners Nov. 18 begging for $30,000 to match a grant that would help them keep the doors open for at least five months. 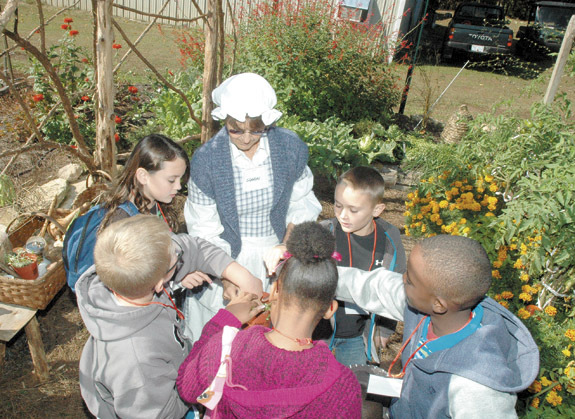 Sharon Billings, dressed in period attire, helps kids with a gardening lesson during the Colonial Hearth Day field trip hosted by Dr. Peggy McGhee. 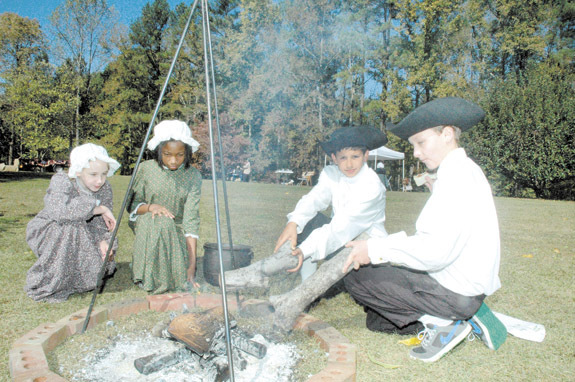 The event is designed to give students a hands-on look at Colonial times, corresponding with lessons they learn in the classroom. The activities are some of the same the Pilgrims and Native Americans would have used during the first Thanksgiving. YOUNGSVILLE — When the town began looking for a new parks and recreation director in October, town commissioners said they weren’t in a rush. They wanted to find the right person. Less than a month later, they said they accomplished their goal. The board agreed to hire Ronald “Pete” Gibson as its new director. Don’t look now but Santa’s on his way! FRANKLIN COUNTY — Franklin County residents and visitors will have plenty of chances to ring in the holiday season. Franklinton gets things started with the county’s only night-time parade, at 7 p.m. Dec. 5 — rain, shine or snow. And two days later, at 7 p.m. on Dec. 7, the town will host Christmas on Main, a middle of the street event featuring Christmas carols from area churches and the lighting of the town Christmas tree before people embark on the Holiday Lights Tour — a trip around to the more extravagant displays in the community. If you’re reading this, there is one happy turkey! By the time you are reading this it will be almost Thanksgiving — and there won’t be a turkey happier than me about that. This has been one of those holiday seasons ... you know, one of those seasons! 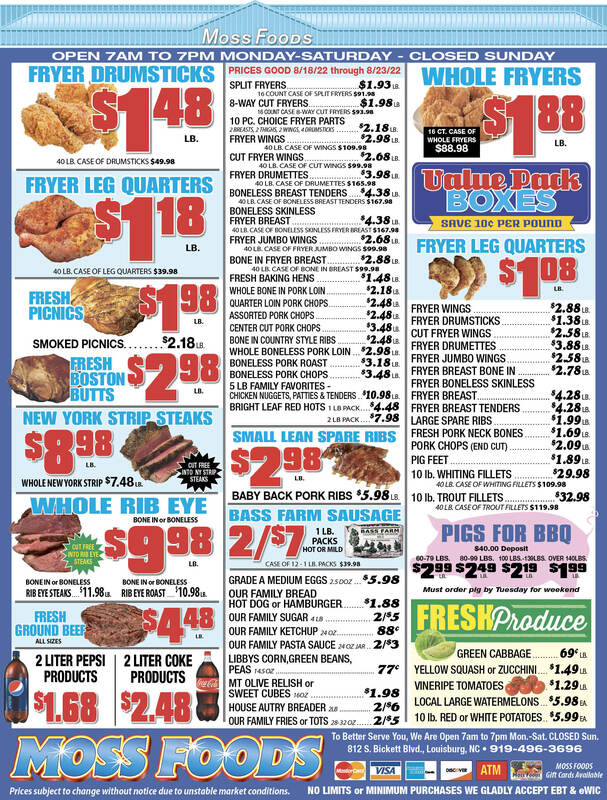 Normally, the last two or three weeks before Thanksgiving are the busiest of the year for newspapers and this year was no exception, although the pall hanging over the local economy and the uncertainty experienced by many merchants has kept a damper on advertising and revenue this year. More missing money hints at big problem! Yes, money is apparently missing from a Franklin County office. And once again the State Bureau of Investigation has been called to figure out what happened and who is responsible. 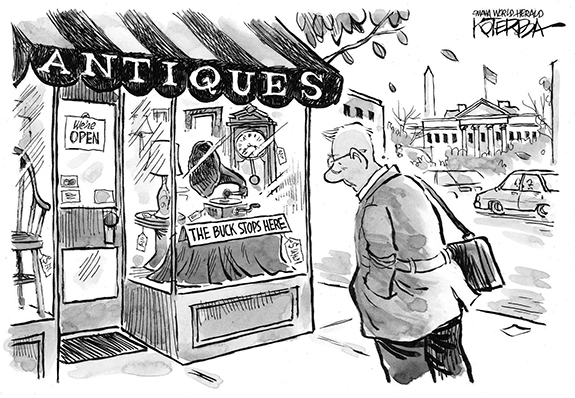 There used to be a certain mystique, almost a charm about Black Friday. Back before it was en vogue and became “commercial,” the idea of folks beginning their holiday shopping at Oh Dark Thirty was, well, quaint. You would hear stories about people who began lining up at their favorite stores at say, 5 a.m. or 6 a.m. Sometimes I scratch my head and wonder why certain ideas receive opposition. I then take the actions of a prudent man and research the topic via sources selected for their credibility. 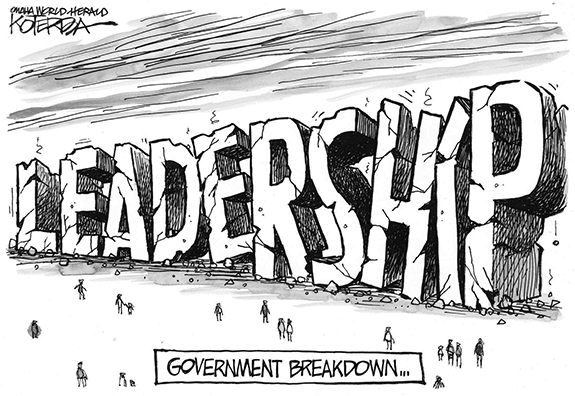 Such was the case when criticism of Common Core arose. Common Core is the result of a collaborative effort of several governors and state education departments to develop a set of minimal uniform standards for K-12 students in math and language skills, which will guarantee a minimum national standard in American education. In July of this year, I engaged the issue of Franklin County economic development. Over a number of months I explored many of the related issues. I am not going to cover everything discussed in those many articles. However, to give readers some context, I need to highlight some of what was covered. In response to both former Sen. Doug Berger’s (D) recent letter to the editor and Franklin County Democrat Party Chairman Larry Marciniak’s recent column, both in The Franklin Times regarding our group, We the People-Franklin County Patriots reading of the U.S. Constitution and its original 10 amendments, I feel the need to set the record straight on their questions and comments. LOUISBURG - Diane “Buzz” Finette Fleming, 71, died Friday, Nov, 22, 2013. LOUISBURG - Funeral services for Ethel S. Egerton, 96, who died Friday, Nov. 22, 2013, will be held at 11 a.m. Saturday, Nov. 30, in the Richardson Funeral Home chapel in Louisburg. Burial will follow in Oakwood Cemetery. LOUISBURG - Eugene Gerald Lutz Sr., 73, died Wednesday, Nov. 20, 2013 at his home. Funeral services will be held Saturday, Nov. 30, at Grace Assembly Church, 205 Wait Avenue, Wake Forest. Viewing will be at 2 p.m. and services will follow at 3 p.m.
SPRING HOPE – Henry Newell Colbert, 73, died Saturday morning, Nov. 23, 2013. A funeral service was held Monday, Nov. 25, at Duke Memorial Baptist Church. Burial followed in Lancaster Memorial Park. 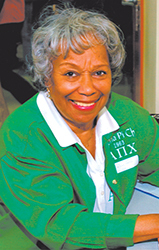 LOUISBURG —Funeral services for Jola Johnson Perry, 84, who died Monday, Nov. 25, 2013, will be held at 12 noon Saturday, Nov. 30, at Allen Chapel Baptist Church. Burial will follow in the church cemetery. LOUISBURG – Joseph Earl Smith, 90, of Louisburg, died Monday evening (October 28). Joe was a son of the late M. Coleman and Lula Hedgepeth Smith. He was preceded in death by his daughter, Carolyn W. Langley; sister, Sybal S. Ball; brothers, Downey Smith and Egbert Smith. LOUISBURG - Ridley Laverne Gupton, 65, of Louisburg died Thursday, November 21, 2013 at his home. Born April 13, 1948 to the late Laverne and Louise Brown Gupton. Ridley loved his family and friends and his two dogs, Zoe and Ty. He was also preceded in death by his wife, Jackie M. Gupton. LOUISBURG - Susie Yarborough Hawkins, 93, died Tuesday, Nov. 19, 2013 at her home in Louisburg. A funeral service was held Monday, Nov. 25, at St. Paul Presbyterian Church, Louisburg. Burial followed in the Cemetery on the Hill, Louisburg. HOLLISTER - Funeral services for William “Bill” Richardson, 79, who died Sunday, Nov. 24, 2013, will be held at 1 p.m. Wednesday, Nov. 27, at Walker’s Chapel Holy Church, with the Rev. Hurley Richardson officiating. Burial will follow in the Faith Baptist Church cemetery. BUNN - Doris V. Creasy, 78, who was known as “Nanny” to many, died Monday evening, Nov. 25, 2013 at her residence. Funeral services will be held at 2 p.m. Friday, Nov. 29, in the chapel of Bright Funeral Home. Burial will follow in the New Light Baptist Church cemetery. FERRELL FOLLOWS THE LEADERS. 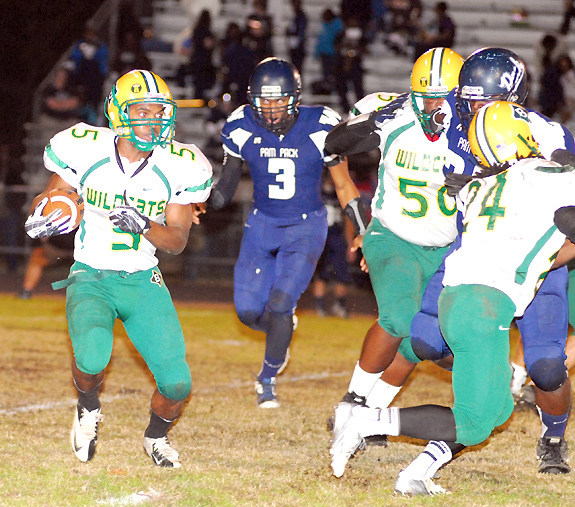 Bunn High School’s Tevin Ferrell (with ball) picks up yardage behind strong blocking during the Wildcats’ loss last Friday night at Washington in the second round of the Class 2-AA State Football Playoffs. WASHINGTON -- Given the fact that Bunn had a new-old coach, a different offense and only one starter returning from last year, it would be easy to surmise that the Wildcats overachieved during the 2013 football season. However, that doesn’t make the end of the campaign any less painful. Taking on a powerful, touted Washington club, the Wildcats came within a field goal of forcing overtime -- only to see the attempt blocked in the closing seconds. BREAKING AWAY. 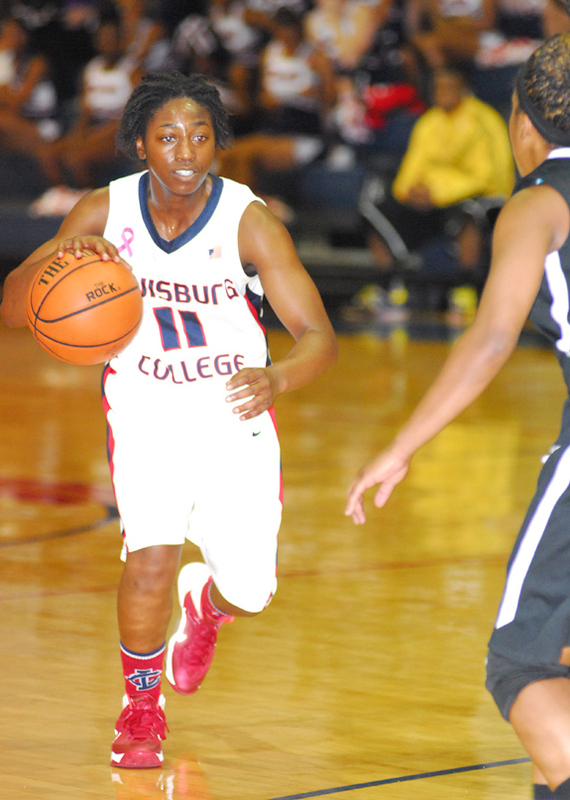 Louisburg College’s Sycoya Dorsey drives for two points during the Lady Hurricanes’ home basketball win last Thursday against Clinton Junior College at the Taylor Center on the LC campus. LOUISBURG -- The hardest-earned victories are often the ones that strengthen a team the most. That’s what Louisburg College women’s basketball coach Shay Hayes hopes will happen after the Lady Hurricanes rallied to secure a 70-68 road decision last Saturday at Region X rival Wake Tech Community College. 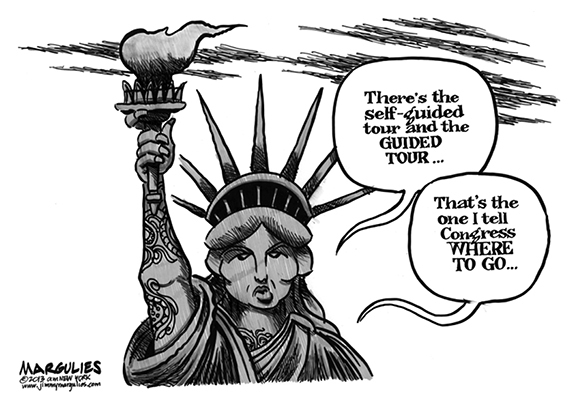 LC had been a frontrunner while rolling through seven foes to begin the campaign. HOLD ON TIGHT. 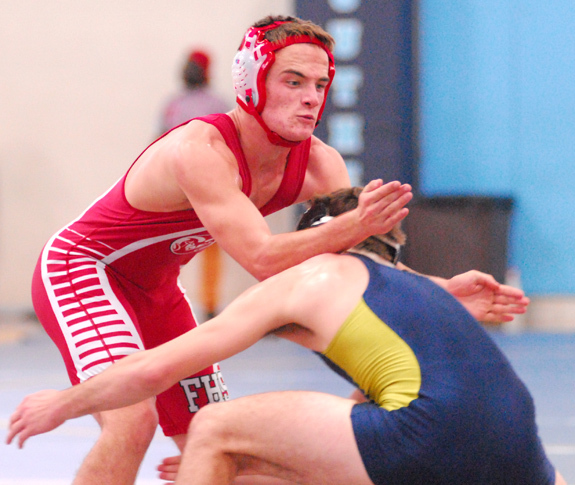 Franklinton’s Jacob Coats (left) tries to maintain his footing as part of the Red Rams’ match against Rocky Mount last Saturday morning at the Southern Vance High School Runnin’ Raider Wrestling Tournament in Henderson. 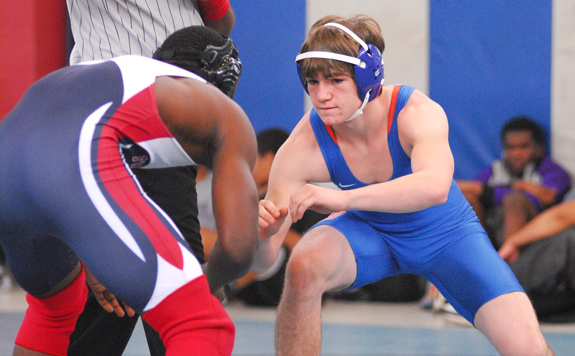 HENDERSON -- Alan Carter knew exactly what his Franklinton High School wrestling team would be up against during the Southern Vance Runnin’ Raider Duals Wrestling Tournament last Saturday. And that suited Carter just fine. 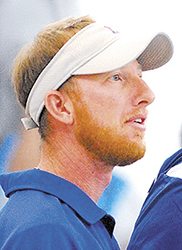 With the intention of making sure his Red Rams will be in top form come Northern Carolina Conference time, Carter has undertaken an adventurous early-season schedule by design. KADARIUS CAN’T BE STOPPED. 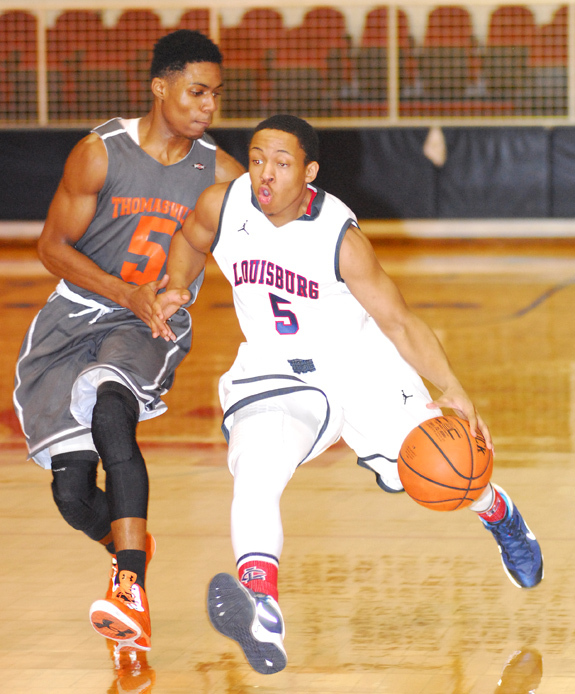 Louisburg’s Kadarius Turner (right) drives toward the basket during last Wednesday’s home win versus Thomasville Prep. LOUISBURG -- Coach Mark Vanderslice and his Louisburg College Hurricanes returned to practice this week in an unfamiliar position -- they were coming off a rare loss. And though no coach likes to see his team defeated, most will agree that the lessons learned along the way can be valuable in the long run. THE BISHOP RETURNS. Ryder Bishop (right) will be one of the key veterans this season for the Louisburg High School wrestling team. 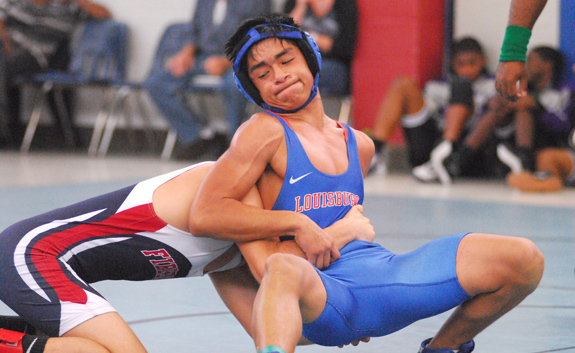 LHS took part in the Southern Vance Duals last Saturday. HENDERSON -- After building an area powerhouse, the Louisburg High School program has gone through a few rough years. Last season, LHS’ squad consisted of only three or four performers as the campaign progressed -- and that resulted in some lopsided dual scores against the Warriors. 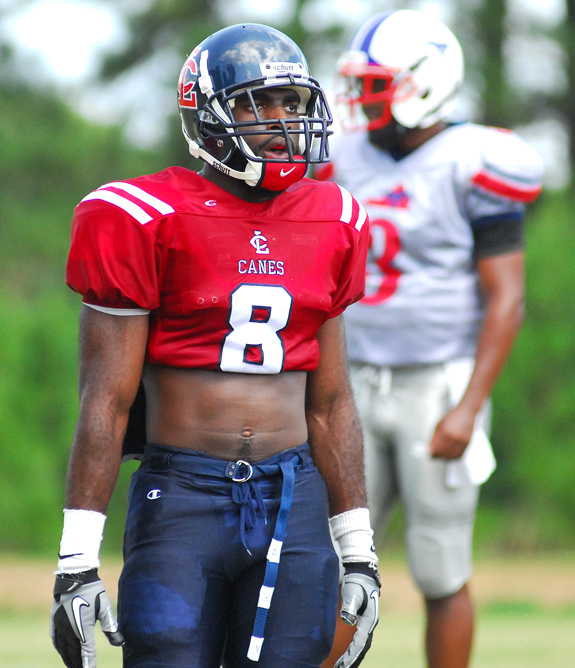 LOUISBURG -- Louisburg College placed a trio of players on the All-Northeast Conference Football Team for the 2013 season. Making the list for the Hurricanes were offensive lineman Donald Reid, linebacker Stephen Williams and defensive back Jervon Christopher. ZEBULON -- Two players from the Carolina Mudcats’ 2013 squad took home year-end honors from the Cleveland Indians last Thursday afternoon. Right-handed pitcher Cody Anderson is the Bob Feller Award recipient for top organizational pitcher. Second baseman Joey Wendle was announced the winner of the Lou Boudreau Award for top position player. NASH COUNTY -- What a remarkable year 1993 was. History was made when North Carolina sportsmen saw the need to feed the hungry and began the grassroots program of venison donation. The NC Hunters for the Hungry program was formed as a 501 c (3) tax exempt, non-profit organization to coordinate the efforts of hunters, sportsmen’s organizations, processors, food banks and generous individuals to feed the hungry with our abundant natural resource the white-tailed deer – venison. 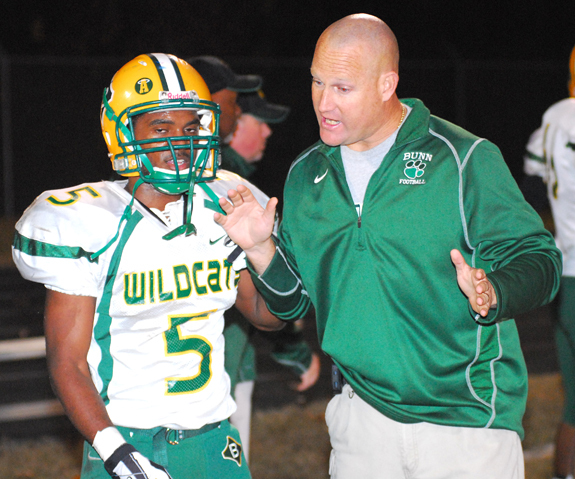 Bunn’s Tevin Ferrell (left) gets some defensive tips from assistant coach Larry McKeithan during last Friday night’s setback against host Washington High School in the second round of the Class 2-AA State Playoffs in Beaufort County. 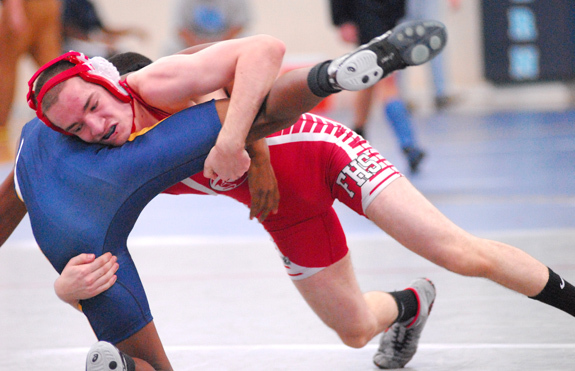 Franklinton’s Greg Purvine picks up a pinfall last Saturday against the Rocky Mount Gryphons. 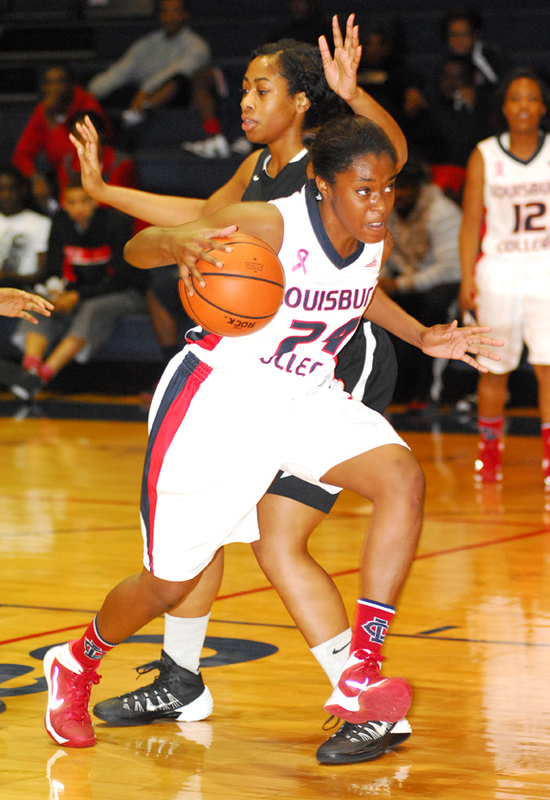 Louisburg College’s Courtney Raiford (with ball) looks for an open teammate during last Thursday’s home victory against Clinton Junior College. 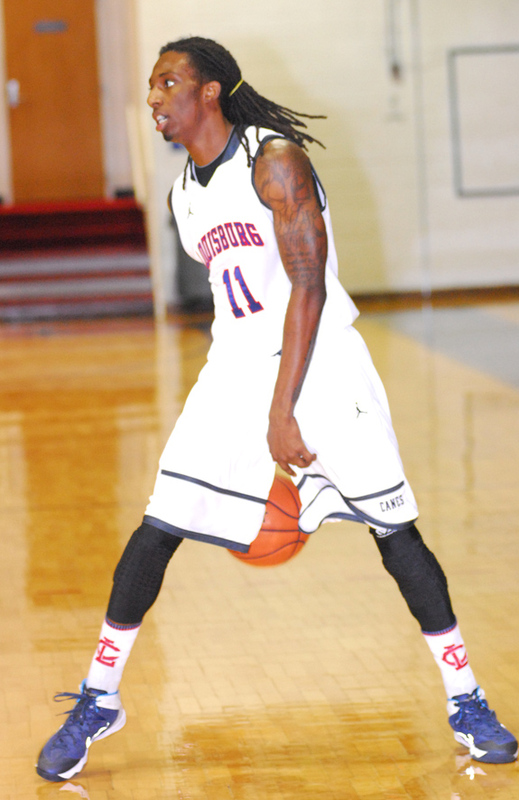 Tyrice Thomas poured in a career-high 18 points to lead the Louisburg College Hurricanes to a home win last Wednesday against Thomasville Prep. Louisburg High School’s Moy Saldana (right) keeps his footing during a match against a Southern Nash performer as part of last Saturday morning’s action at the Southern Vance High School Runnin’ Raider Duals Tournament, which was held in Henderson. Washington’s Stevie Green had a big night as the Pam Pack edged Bunn by a 35-32 score last Friday night in the second round of the Class 2-AA State Football Playoffs. 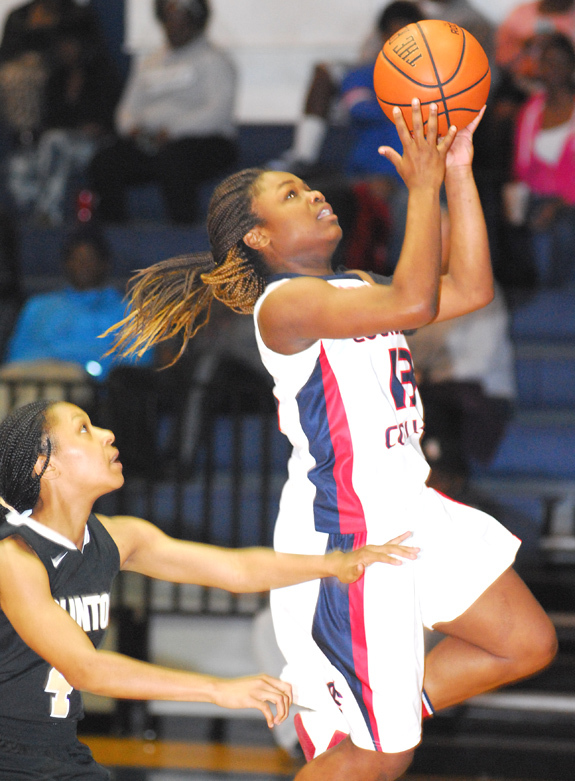 Louisburg College’s Zana Tatum makes a strong move in the paint for the Lady Hurricanes during last Thursday evening’s home decision against Clinton JC at the Taylor Center. John H. Williamson’s determination to learn how to read and write prepared him for a life of service to his county and state. Williamson was born on Oct. 3, 1844, to slave parents who belonged to General John Napier Williamson of Covington, GA. After General Williamson died in 1857, his widow, Temperance Perry Williamson, a native of Franklin County, moved to Louisburg, bringing John and his parents with her. Emily Lynn Ayscue and Bradley Ray Bassinger were united in marriage Saturday, Aug. 3, 2013 at 3 p.m. at Locust Grove Baptist Church in Weaverville, N.C. Ben Whitmire, pastor of Locust Grove, officiated the double-ring ceremony. 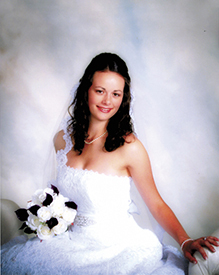 The bride is the daughter of Mr. and Mrs. Mark S. Ayscue of Kittrell. She is the granddaughter of Juanita Ayscue and the late Calvin S. Ayscue of the Epsom Community and Elsie B. Mayo of Louisburg. The December concert at Cherry Hill Plantation in Warren County will feature Aurora Musicalis, a group that includes Brian Reagin, violin; Elizabeth Beilman, cello; Jimmy Gilmore, clarinet and John Noel, piano. They will perform works by John Williams, Fruhling and Brahms at 3 p.m. Sunday, Dec. 1. 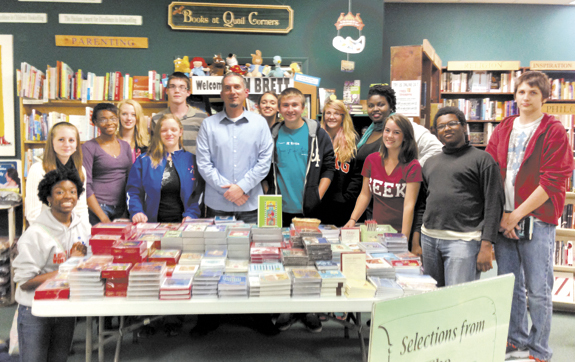 The Louisburg High School Warrior Book Club went to Quail Ridge Books recently to meet with author James Dashner. Dystopian literature is a very popular genre and Dashner’s book, “The Maze Runner” will be released as a movie in 2014. Students were able to talk to Dashner and he signed copies of his books, including “The Eye of Minds,” which is the first book in a new trilogy set in a world of hyperadvanced technology. 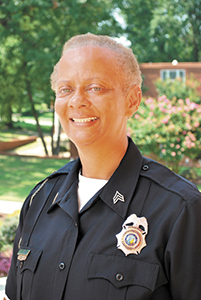 Louisburg College announced the appointment of Vicki Reid as chief of campus police, effective Nov. 1. The change follows the departure of Jeffrey Linney, who moved on from the college after five years of service to complete his doctoral study in information systems. Reid has been part of Louisburg College campus police since 2010. 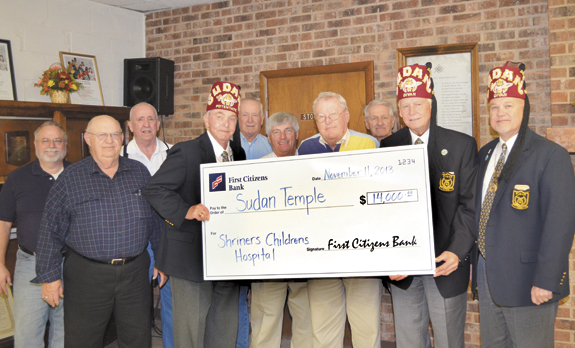 The Franklin County Shrine Club is at it again ... this year presenting a check for $14,000 to Shriners Childrens Hospital, a network of hospitals that provides free care to crippled and burned children nationwide. The Franklin County club has been holding fish fries and other events for decades, all to raise money to help children they will never know. This year’s contribution brings the total they have donated to Shriners Hospitals to $194,110 — in the last decade alone! Do you need tires with that Shop Sauce order? 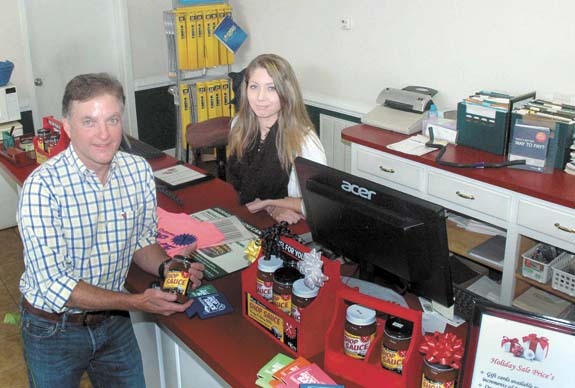 LOUISBURG — When people walk through the doors of Pete Smith’s auto shop, proprietor Keith Smith tries to make their experience as pleasant as possible. But there’s no getting around the fact that customers are usually there for a reason — their vehicle is broken down and they’re pretty bummed about it. ALLEGIANCE. 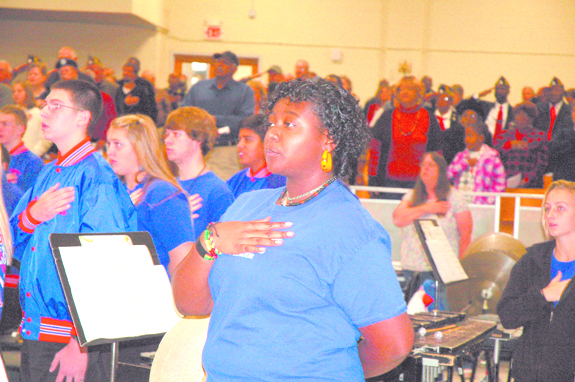 Louisburg High band percussionist Johnica Daniels joins others in the Pledge during the Veterans Day program earlier this month. The band provided the music during the event. LOUISBURG — Franklin County is home to 3,000 veterans. The state, itself, is home to more than 760,000 veterans, sustains more than 120,000 active duty military members and eight military installations — giving it the third highest military population in the country. And the military is the basis for 15 percent of the state’s economy. It’s also home to four Veterans Administration hospitals. LOUISBURG — A local group started up under the banner, Give to Kids, is trying to do just that. Since the beginning of the school year, organizers have teamed up with elementary school guidance counselors to provide needed items, such as food and clothes, to students who — for whatever reason — might otherwise slip through the cracks of other giving organizations. WHERE THE HEARTH IS. Members of Franklinton Elementary’s AIG program, from left, Erica Brane, Kelsie Pendergrass, Daniel Morales and Evan Ivey tend to a fire. The group added some youth to the re-enactments. FRANKLINTON — Last year, Peggy McGhee transformed her farm and transported youngsters back into the 1700s, giving Franklin County fourth graders a true hands-on learning experience. When the Colonial Hearth Day field trip event was done, the retired educator was proud and happy that kids had a good time and learned something. HENDERSON — Authorities locked down the main campus of an area community college earlier this week amid the threat of an armed gunman. According to Vance-Granville Community College spokesperson Stacey Carter-Coley, an individual was believed to have been armed while on the college’s main campus in Henderson. Carleina Hampton-Harris, a member of Nu Epsilon Chapter of Alpha Pi Chi National Sorority, Inc. in Louisburg, was honored as an “Unsung Hero” recently at Winston-Salem State University during Homecoming Weekend activities at the Clarence “Big House” Gaines Luncheon. First sighting of Santa ... ready? SIGN OF THE SEASON. 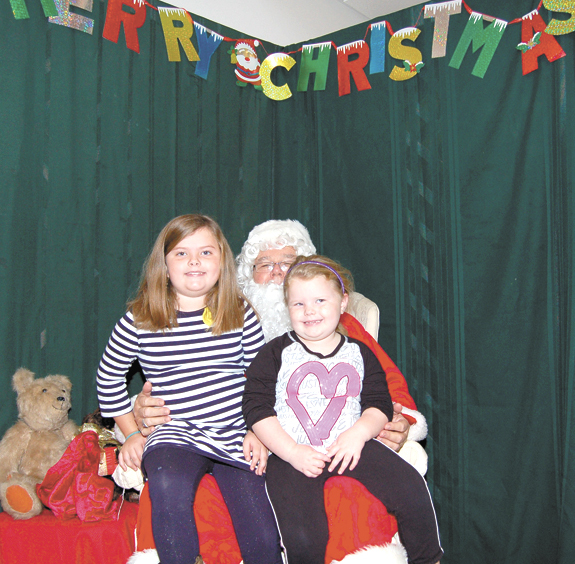 Santa was as jolly as ever at the Louisburg United Methodist Church bazaar recently. Visiting with Santa are Madison Nelms, age 7 and sister Emma Nelms, age 4. The Pilot Lions Club will have its annual Thanksgiving morning breakfast, 6 to 10 a.m., at the Pilot Lions Community Center. Breakfast cost is by donation. Proceeds benefit the Lions Community Park and other worthwhile Lions projects. A reverse raffle will also be held with a grand prize of $1,000. See any Lion for raffle tickets.